Technically advanced trekking trousers with optimised fit and carefully planned details. Intended for alpine trekking that requires climbing – where mobility is just as important as durability and protection from sharp stones. The rear and knees are pre-shaped and have extra strong seams for this reason. 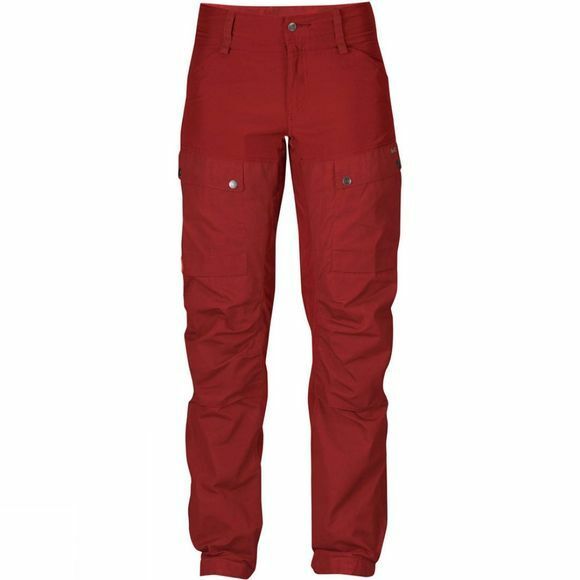 And that is also why the trousers have durable G-1000 Eco on the rear, front of the legs, the knees and on the inside bottom of the legs, which is also reinforced with a double layer of fabric to withstand wear from hiking boots. The seam on the inside of the thigh has been moved and replaced by a connecting fabric panel to reduce the risk of chafing and wear. A zipped ventilation opening from knee to hip and along the calf releases excess heat. Two leg pockets with pocket cover flap, one with a zip and one with a mesh pocket provide storage for bits and bobs. High hand pockets hold their contents even when sitting down.